Exercise Atlasur XI 2018, the multinational biennial maritime exercise between South Africa, Brazil, Uruguay and Argentina, commenced in Simon’s Town on 31 August. The eleventh iteration of the exercise is scheduled to take place from 31 August to 21 September. Argentina will not participate in this year’s exercise, ostensibly due to financial constraints. Similarly, both Brazil and Uruguay have only sent one vessel each. According to the South African Navy, this year’s theme is “Combined we are combating illegal trade (human, drug & arms).” The exercise will aim to maintain, promote and build on previous operational and tactical co-operation between the countries’ Joint Forces. Amongst others these will include training of military personnel and the testing of joint/combined doctrine, focussing on standard operating procedures, inter-operability in a multinational simulated environment and testing sustainment during a period of high demand. The exercise will also provide Joint Force Preparation Training to SANDF elements. Captain (SAN) HT Matsane, the Joint Task Force Commander, said that the exercise is intended to measure the participants training and standards, to see if they can work together. “It will measure the South African standard, where we are compared to other countries in the world and also give us time to train, so we can have interoperability SOPs (Standard operating Procedures) so we can work together any time,” he said. This is the fourth time that Captain SB Ozorio, Commander Task Force for Brazil, is participating in an Atlasur exercise. He said that it is very important to exchange experiences. In 2015, the Brazilian frigate Barroso took part in a six-month deployment off Lebanon as the flagship of the Maritime Task Force (MTF) of the United Nations Interim Force in Lebanon (UNIFIL). Ozorio noted that every Atlasur exercise is a different experience, an opportunity to know people and to make contacts. 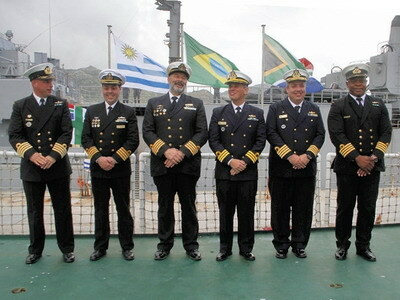 The Commander Task Force for Uruguay, Captain C Coccaro, emphasised that the South American countries were maritime neighbours of South Africa and that it is very important for the three navies to maintain their skills. Under the direction of Exercise Director Brigadier General G Lategan, the first phase of the exercise consists of courtesy calls, with the period 5 September consisting of the final planning conference for the sea phase, integration in the harbour, checking equipment and seamanship in harbour. The Sea Phase 1 will take place from 6 September to 9 September in False Bay. The following five days will include a live firing scenario in the False Bay area and off the West Coast, followed by a rest period in harbour. Sea Phase 2, from 17 September, will see the Uruguayans return home, whilst the South Africans and Brazilians continue with conventional maritime warfare at sea. Following the conclusion of Exercise Atlasur XI on 21 September, the Brazilians will undertake a diplomatic visit to Maputo before returning to Simon’s Town on 1 October for the commencement of Exercise Ibsamar, conducted between South Africa, Brazil and India. The SA Navy, as the lead service of the host country, will be providing most of the participating assets. This includes the frigate SAS Amatola, hydrographic survey vessel SAS Protea, submarine SAS Manthatisi and the Maritime Reaction Squadron assets (boats, reaction force, divers and boarding). The South African Air Force is providing a C-47TP maritime surveillance aircraft, an Oryx medium transport helicopter and two fighters, thought to be Hawks, whilst the South African Military Health Service is represented by 1 Medical Task Group. Brazil will be represented by the frigate BNS Barroso with an AS350 Ecureuil helicopter and 1 Platoon Special Forces, whilst Uruguay is represented by the ROU General Artigas replenishment vessel and a Visit, Board, Search and Seizure (VBSS) team. Whilst the Task Group will consist of one force, the participants will be divided into a Blue and a Red force to make the exercise more realistic, but not one country against the other.